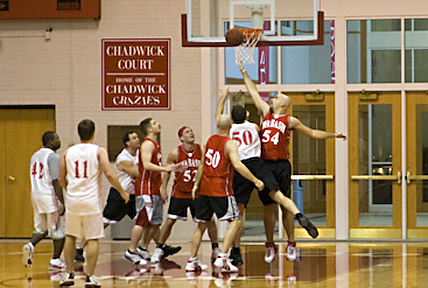 In the space of 40 minutes of basketball, with a continuously running clock, the alumni game ended up 91-80 – 171 points. It was offense, offense, offense…just like the NBA. With lawyer Jon Pactor '71 as a referee, I guess the defense simply rested. For photos, click here and here. The following alumni returned to play – including a couple of former football players who looked right at home on the court.